When one thinks of Ducati, it’s obvious to picture an exotic, sporty and red motorcycle. It’s among the most aspirational brands in the two-wheeler world and its creations have graced the bedroom walls of many teenagers. But an exotic product portfolio meant that brand Ducati remained an unfulfilled dream for many bikers due to their exorbitant price tags. This is something that the Italian brand had tried to address over the past many years and it was finally able to crack the code with the Scrambler. Introduced almost half a decade back, the new-gen Ducati Scrambler paid homage to one of its most popular models from the 1960s. 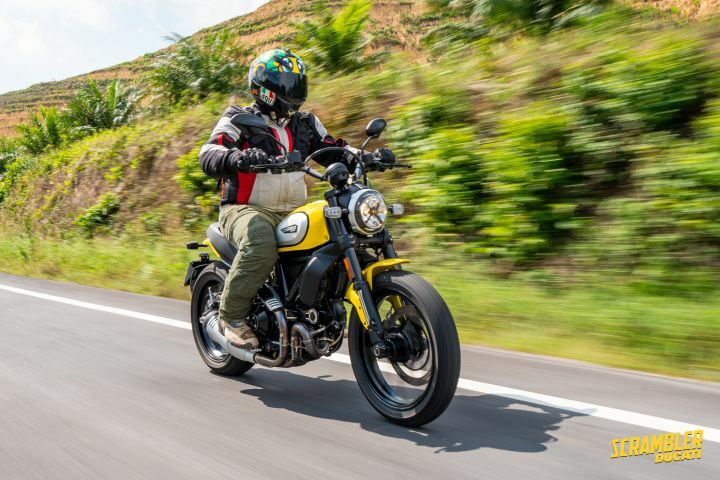 Given its accessible pricing and positioning, Ducati managed to sell over 55,000 units of the bike globally and the Scrambler remains one of its most popular offerings. To keep the bike relevant in today’s market, Ducati has added new features and given the Scrambler Icon a few mechanical and cosmetic updates. So, have these additions ironed out the issues associated with the older bike? Before we proceed, let me make it clear that the new Scrambler gets just a facelift, not a thorough update. Given the subtle changes, one can be forgiven for being unable to distinguish the new bike from its predecessor. But look closely and the differences emerge, such as the LED DRLs, brushed aluminium side plates on the tank, a new muffler and completely redesigned seat. The new Scrambler also features diffused LED indicators that are self-cancelling. Other additions include a revised instrument console that now features a fuel gauge and gear position indicator, while the switch gear has been lifted from the Scrambler 1100, adding a dash of premiumness. The engine case has been finished in black and the diamond-cut alloy wheels do look sporty. It also gets Ducati Multimedia System (DMS) as an option, which in simple language means Bluetooth connectivity. On the mechanical front, the new Scrambler Icon has been equipped with cornering ABS thanks to the addition of an IMU. Also, Ducati engineers have equipped the Scrambler Icon with a hydraulic clutch and tuned the suspension for a comfier ride. As I hopped onto the bike, the 798mm seat height and narrow saddle made me feel immediately comfortable. While the stock seat height will be short enough for most riders, Ducati also offers a low seat that drops the saddle height by 20mm. The tall, wide handlebars offer a relaxed riding posture, while the new seats (with better cushioning) add to the comfort factor. As I started riding, the air temperature was close to 40°C and the air-cooled motor wasn’t providing any relief either. Whenever we stopped or slowed down, engine temperature would rise at an alarmingly fast pace. The exhaust pipes are routed very close to your right leg and thankfully there’s exhaust shields that safeguard your leg from getting toasted. Luckily for my fellow riders and me, the clouds let loose and the rain came down, providing some much needed respite. Mechanically, the powerplant remains identical to the older engine and so do the power figures. The L-Twin motor churns out 73hp and 67Nm of torque, which is rather low for the displacement of the mill. And it’s evident in its performance, because while one can label the new Scrambler as a quick bike, it’s not an out-and-out fast motorcycle. Acceleration is rapid but not jaw-dropping and the Scrambler remains a friendly motorcycle. I particularly liked the precise and crisp throttle response, something the first-gen bike struggled with. The baby Ducati sits at 120kmph rather easily with just minor vibes for company. Devoid of any electronic intervention, the Scrambler Icon is a pure and joyous motorcycle, a combination that’s getting rarer with each passing year. Another useful inclusion is the hydraulic clutch, which makes riding the Scrambler in tight traffic situations a less tedious affair. However, it does have a flaw and that’s its 6-speed gearbox. Finding neutral was a task and shift quality was inconsistent. Also, the side stand takes multiple attempts to engage and it really tested my patience. As we kept riding, the straight roads changed to twisting patches of mountain tarmac and the rain also intensified. I was a bit nervous about the Pirelli MT 60 rubber and its performance on the wet road, but after safely negotiating a few corners my confidence started building. It isn’t the grippiest tyre out there, but managed wet roads rather well. The rear did step out on some occasions, but the slides always happened in a smooth and controlled manner. Another aspect helping the bike’s agility is its low kerb weight of 189kg. Ducati engineers haven’t tweaked the trellis frame or the steering geometry and that’s fine as the Scrambler remains a cheerful and spirited bike to ride around corners. What they did change is the suspension setting and this has resulted in a very comfortable ride. I darted past the few potholes I encountered at over 70kmph and the Scrambler just ironed them out effortlessly. Another major addition on the new Scrambler Icon is the inclusion of cornering ABS. While I didn’t have any hairy moments to test the effectiveness of the system, I am sure it will go a long way in increasing safety during emergency braking situations. Braking hardware remains identical to its predecessor and the single disc brakes at both ends performed their duty well. While the updates made on the new Scrambler Icon are subtle, they do have a strong impact on the rider and the motorcycle. At the heart of it, the Scrambler remains a simple and fun-loving machine that can tackle a varied range of situations. Ducati has made clever additions to its popular offering without making it feel complicated. And it is this “simple at heart” nature that makes it an easy yet enjoyable bike to live with. I personally like the Scrambler Icon for its honesty. It hasn’t gotten caught up in one-upmanship with other motorcycles, and is just happy doing its own thing. It still isn’t a perfect motorcycle. Having said that, it has fixed most of the issues that had plagued its predecessor. We expect the new Scrambler Icon to make its India debut in April itself. The new bike might carry a premium of around Rs 30,000 to 40,000 (the current one is priced at Rs 7.28 lakh). Despite the bump in price, the Scrambler Icon in my opinion is a great option to start your journey with this legendary Italian brand.